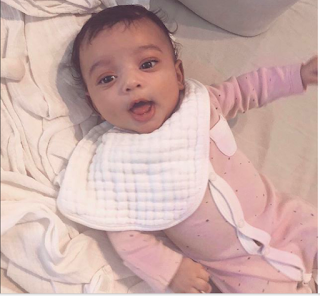 Mother of three, Kim Kardashian, has given the world another glimpse of her adorable new baby daughter, Chicago. The little cute looked like she had just been fed as she stylishly made a goofy face for mummy’s camera. According to her interview with Elle, the 37-year-old said Chicago who was delivered via surrogate -- will likely be her last child with West. “I don’t think I could handle more than that. My time is spread really thin," Kardashian said. Chicago is joined by North, 4, and Saint, 2.